It has been a long time coming. I started my journey of discovering my connection to the Mayflower about 7 years ago. I have a bit of a special circumstance since my dad was adopted. I knew my mom's family history (only a few generations in the United States) and my dad's adopted family history (which I wasn't genetically connected to). However, 7 years ago, my brother had discovered my dad's birth mom in Cape Elizabeth, Maine. We discovered this whole new family history which had never been known to us. It took a few years, but I was able to trace the family history back to Stephen Hopkins of the Mayflower. However, anyone who has done genealogical research (especially using Ancestry.com) will tell you that some times the information you gather can be a little flimsy at best. I worked diligently to gather the information that I needed to be sure my information was accurate and defensible. In November 2016, I started the process of applying to the Mayflower Society. I will admit I had been putting this off as I had gathered all this information and I "knew" I was descended from Stephen Hopkins, but had this fear that the society would reject me as some of the documentation wasn't "perfect". It isn't easy to get birth certificates, marriage certificates and death certificates for the last 400 years. One of my biggest challenges was David Godfrey's daughter who married Peter Bishop. David Godfrey's daughter was born in New London, Connecticut around 1757. Unfortunately, Benedict Arnold (yes that Benedict Arnold), burned the town of New London during the revolutionary war and all the vital records were destroyed. Luckily, I was able to find the will of David Godfrey where he provided a sum of money for his granddaughter, Elizabeth Bishop.....so I was able to prove the family connection to the other family research that I had completed. To this day, I still don't know David Godfrey's daughter's actual name...there is no documentation of it. Last night I received an email from the Mayflower historian. I am so happy to inform you that you have been accepted into the Mayflower Society. I know this was very important to you and a great honor. You will be receiving a certificate and a copy of your approved application from our state historian, Muriel Cushing in a few weeks. I couldn't be happier! 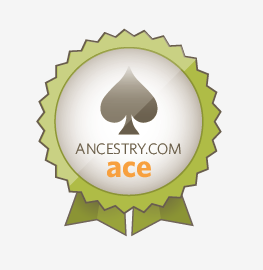 For those of us who love genealogy it is a great feeling to have your hard work and research validated and confirmed. I am proud of finally being able to prove our family connection to the Mayflower and think this is something that my kids, future grandkids and all future family members will appreciate. In addition, I want to acknowledge and say how much much I appreciate all the help I have received from distant family members in parts of my research. Amateur genealogists are the most helpful people on the planet and I don't think I could have felt confident in submitting this application without the help of those distant family members who helped me uncover family stories, previously unknown to me family history documents, birth certificates, obituaries, etc. Thank you so much! For those of you who follow my blog because we are distant Fuller cousins....get those Mayflower applications ready as this approved applications just made your own applications a lot easier.